Mark Hennies: TECOdevelopment GmbH, Marie-Curie-Str. 1, 53359 Rheinbach, Germany, hennies@tecodevelopment.com. Cortisol determination in plasma is the most commonly used indicator of stress in fish. In order to avoid sampling induced stress, alternative matrices for cortisol measurement are reported, as gut content, lateral muscle, caudal fin and skin mucus taken postmortem. Another approach is to determine cortisol in the holding-water. 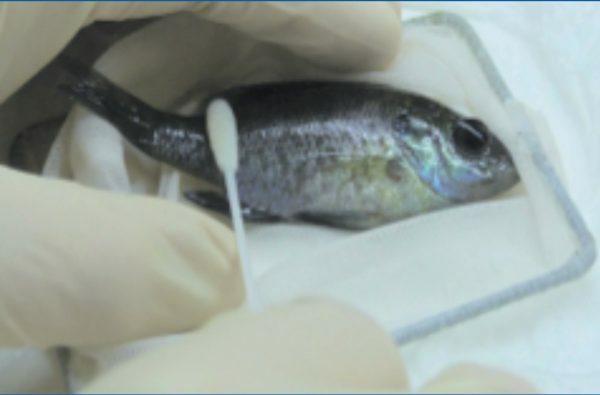 In order to obtain individual cortisol values in living fish we combined a non-invasive epidermal mucus sampling with a Saliva Cortisol ELISA. Within a Tilapia group (Oreochromis niloticus) 5 dominant und 4 subaltern fish were identified by observation. Mucus samples from each fish were taken using the TECO Mucus Collection Set (TECOmedical, TE1034) as demonstrated in Fig.1. Samples were kept frozen until analysis in the laboratory. The dominant fish were then placed into a bucket containing 30 l of fresh water and swirled for one minute to induce stress. Mucus samples were taken for a second time as described before. Analysis: 500μl Extraction buffer (TECO Mucus Collection Set; TE1034) were added to the swab tubes 15-30 minutes before vortex. After vortexing the swab tip was discarded. 50μl of the extracted sample was analyzed in a Saliva Cortisol Assay (TECOmedical, TE1052) which is validated for fish mucus cortisol. In order to correct possible differences in mucus amount obtained with the swab between fish, all samples were also analyzed for total protein by using a colorimetric method. 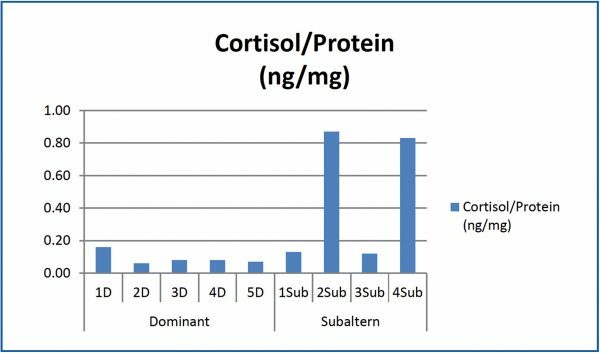 There was a clear difference in the mucus cortisol level between dominant (mean: 0.05ng cortisol/mg total protein) and subaltern fish (mean: 0.22ng cortisol/ mg total protein) as shown in Figure 2. 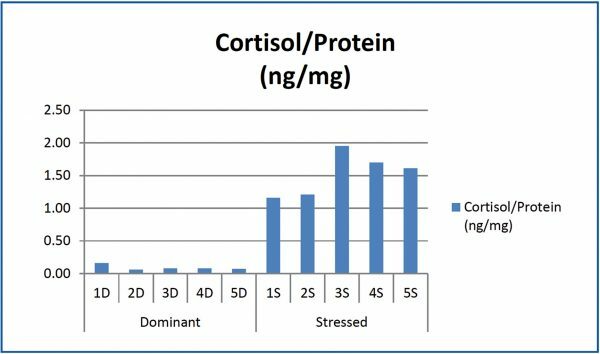 While dominant fish had mucus cortisol level close to the detection level of the ELISA kit, the values rose after induction of stress (mean : 1.44ng cortisol/mg total protein) as shown in Figure 3. For the first time we describe a system for non-invasive cortisol determination in individual fish. The TECO Mucus Collection Set allows a fast and smooth sampling – the differences in cortisol level between dominant and subaltern fish groups as well the cortisol increase after stress induction demonstrate the potential of the system. In further studies it has to be evaluate, if this collection method allows even repeated sampling with minimum sampling induced stress effect.